There is an occasional magic to be found in things that, while being tangibly drawing on a variety of sources (whether related or not) they swirl them together and produce something awesome in composite. Enter Heaven That Dwells Within. Though slapped with a particularly generic black metal/crust tag, spiritually (and practically) there’s far more DNA shared with what Wormwitch is doing here with the likes of Tribulation than a band like Martyrdöd. It’s exciting. But what does that mean? The black, death, and crust elements are certainly all present on Heaven That Dwells Within, present and flow in and out effortlessly as the album shifts its face. And it shifts a lot. Melodic death metal meets blackened furies across “Benighted Blade”, melodic black in all its driving grandeur awaits on “Disciple of the Serpent Star”, and folksy clean-sung underpinnings rear their head in the multifaceted “Dancing In The Ashes”. It’s not a kitchen sink approach in the classic sense but it is incredibly variable and maintains a freshness throughout because of it. All of it delivered with a focus and zest that is nothing if not infectious, there is a tangible spirit of rock to what’s being presented. This, perhaps more than drawing on the same basic materials, likens the band to Tribulation more than anything in the music itself. 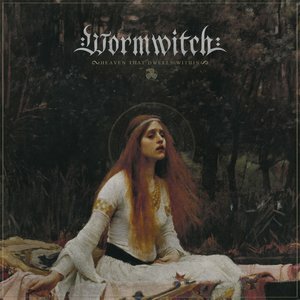 Though the two bands certainly draw on a lot of the same basic materials, Wormwitch presents them different. Though weighing in with 10 songs and 45 minutes, there is a breezy listening quality to Heaven That Dwells Within and the songs can be recognized individually without the experience blurring together. Heaven That Dwells Within is an easy companion, fitted with many weapons with many more uses and ways to be enjoyed. With immediate punch and long-term viability as a grower, it’s a joy. Likely as much in creation as it in experience. Embrace it, enjoy it.